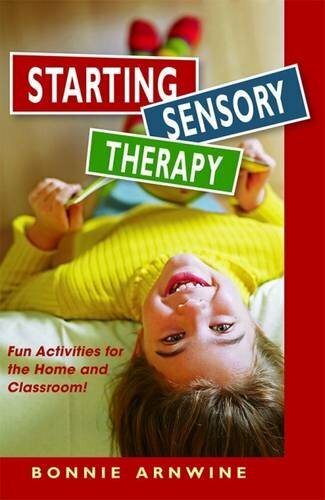 Starting Sensory Integration Therapy offers 100+ activities and games for children with Sensory Processing Disorders (SPDs). Parent of a son with SPD, author Bonnie Arnwine chose activities that require minimal time, money, and clean-up. Most “ingredients” are already on hand: empty yogurt cups, string, soap, Kool-aid, flour, paper plates, etc. If the kids tire of an activity, an “Extend It!” section shows how to use the same ingredients in new and different ways. Kids have fun while activities exercise the seven sensory “muscles”: the visual, auditory, tactile, olfactory, oral, vestibular, and proprioceptive senses. Activities can be enjoyed with others, so children also benefit from interacting socially with their peers, parents, and teachers.